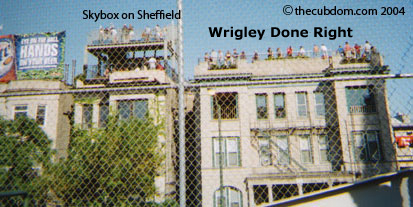 The original Wrigley Field rooftop directory is now too big for one page, so I've moved the street level pictures to a new page. I don't have a decent picture of Murphy's or the Cubby Bear. 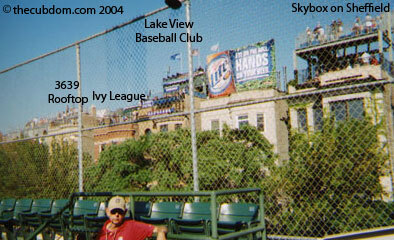 A picture of 3639 Wrigleyville Rooftop, The Ivy League, the Lake View Baseball Club, and Skybox on Sheffield. 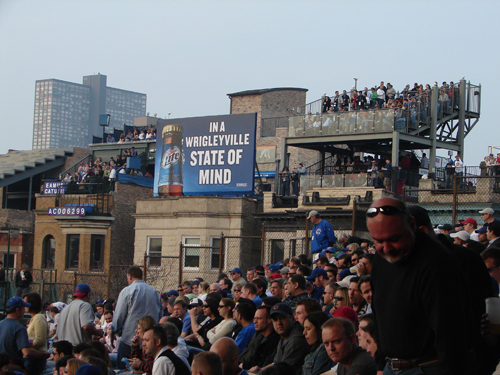 A picture of Skybox on Sheffield and Wrigley Field Done Right (formerly Tailorgators) along the rightfield line. 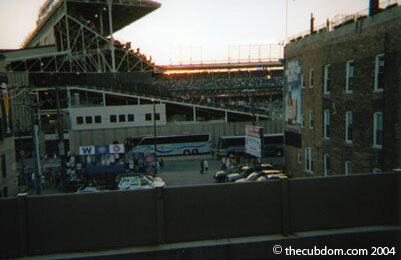 the view into Wrigley Field from the Addison St. "L" station in 2004, this view was blocked in 2008 by the construction of The Sheffield Baseball Club and The Wrigley Field Rooftop Club.